Anyway, after washing a big pile of dishes (with gloves, which you should alway wear too) and some other chores, I did take some pictures of my day 4 wear test of ManGlaze Fuggen Ugly. So these were taken after 72 hours. As you can see there is just a little more tipwear than on day 3 but it's still pretty good. I also included a swatch of my unseen right hand, which was quite acrobatic, to show you that tipwear is similar on both hands. Wiered thing is that I really find the finish to be satin, shiny-ish, now but I picked up one of my friends from work and her collegue told me that she loved my matte nail polish. ??? !!! Well, she wasn't a nail freak like us, lol. My friend got a fish pedicure (don't worry, I'll spare you the sight of feet). I don't know what you think about it, I know there's a big debate about the subject but since I was dragged there I thought I'd show you some pictures. You can see on the picture, without the macro mode, that from a distance the tip wear is almost imperceptible. I won't even mention my total shock at the state of the polish. I think ManGLaze should send you a couple of bottles for free, because you're totally making me (and probably lots of others) buy this. I mean, the pictures speak for themselves. Amazing! 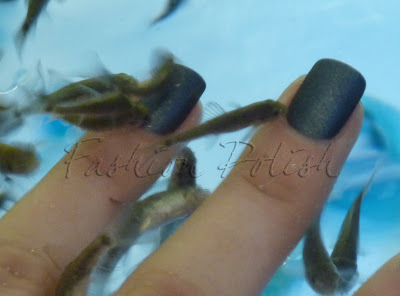 I didn't get the fish manicure, I just stuck my hands in the water and took a couple of pictures to show you guys. It's surprising, a bit tickling at first but it doesn't hurt at all. I didn't know what to think about it because I looove animals so much. Wow, these pictures are amazing =). elle sont génial tes photos,surtout celles avec les petits poissons !!!!! lol !aby ! TROP COOL LE VERNIS !! et les poissons tu est allée en institut ou chez toi ? ?